How to Clean Fishing Reels: Are You Doing It The Wrong Way? ​A fishing reel is the important fishing equipment for an angler. It is a cylindrical-shaped fishing gear. It is for winding and stowing the fishing line. Usually, it is attached to the fishing rod. A lot of fishing reels are built to last. Proper maintenance of your reel ensures it stays effective and increases its durability. There are different types of reels but their working mechanism is the same, and therefore the cleaning basics are the same. Modern reels are sophisticated machines. A fishing reel has to be cleaned the right way, or it may get damaged. Never use a fishing reel that has dirt and grit, it will get damaged. Various factors will determine how often the fishing reel should be cleaned. Whether it is used in freshwater or saltwater fishing, and how much dirt or sand got exposed to it. Salty waters are an enemy to a reel. A reel used in saltwater fishing is cleaned to prevent corrosion of the equipment. You need to keep the bearings, gears and reel body corrosion free. Even the ball bearings and gears of a reel used in freshwater fishing get corroded by water, dirt and grime over time. Corrosion affects the performance of the reel. Retrieval becomes hard, and most of the other functions get affected too. Cleaning, removing grease and reapplying grease to the gears and oil to ball bearings will keep it working effectively. Some reels can be cleaned well without the need to take it apart. After a fresh water fishing trip, clean the reel’s external. Rinse the reel with clean water and let it dry in the air. Then lubricate accessible moving parts. If you were fishing in salty waters, you must remove the salt residue. Start by removing the spool and soaking it in clean water. Clean the grime using a soft cloth first then use a garden hose or spray bottle to remove the salt or other dirt by applying low-pressure. Also, rinse the body of the reel. Let it dry well. Lubrication is very essential if you were using the reel in salty waters. Lubrication prevents corrosion. Use lubricants specific for fishing reels. If your reel has a maintenance port, apply a drop of oil to this port after every four fishing trips. If you are confident about taking apart your reel, here are some guidelines. Put the reel parts in the order you are taking them apart to make reassembling them easy. You need various tools for disassembling and reassembling a reel and also cleaning the parts. If your reel came with tools, use the toolkit. You need the user manual that came with your reel that lists the parts of the fishing reel. A screwdriver is useful for the purpose of taking the reel apart and reassembling it. An old toothbrush is excellent for scrubbing gears whereas toothpicks or cotton swabs are for applying grease to the reel’s gears. You will need to choose a cleaning solution. A cleaning solution will help in removing contaminated oil or grease from the reel. You can buy Reel cleaner, Penn Rod, Ronsonol lighter fluid or Simple Green cleaning compound. Alternatively, you can choose to use a mild dish detergent. Therefore for disassembling and cleaning your reel, you need a cleaning solution, two small screwdrivers, a toothbrush or small paintbrush, a toothpick, Super Lube grease, a container with hot water, the reel’s user manual, cotton swab and a pair of tweezers. Please follow the manufacturer’s recommended cleaning products. Take the reel apart. Avoid putting parts together. Use masking tape to number each part so that it will be easier to reassemble the reel. Avoid placing metal parts together. User tweezers for handling wire clips and springs to prevent them from getting lost. Remove the fishing line from the spool, or you can put masking tape to secure it on the spool. 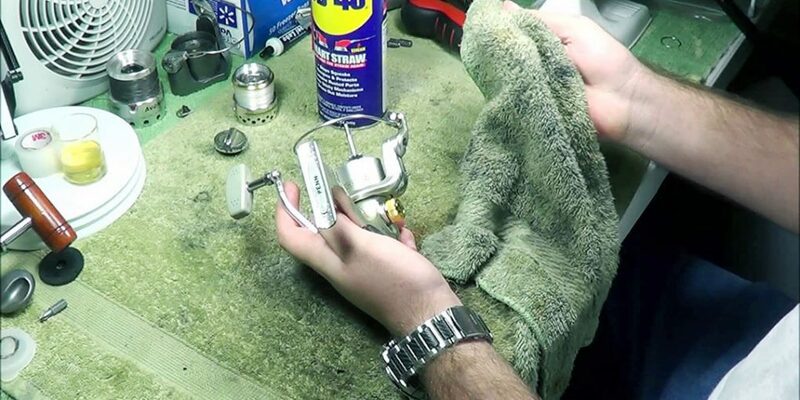 Avoid gasoline when cleaning a fishing reel. Gasoline melts plastic. Use a product that won't destroy fiber material or plastic materials, for example, Simple Green or use a mild dish detergent. Use a toothbrush or a small paintbrush to clean the parts. Then rinse the parts thoroughly and dry them with a clean, soft piece of cloth. Clean the reel bearings with lighter fluid. Ensure they can spin after cleaning. Spinning means that all the dirt is removed. Leave the parts to dry well before oiling and greasing. You need to grease the gears and oil the ball bearings. Follow the directions given by the manufacturer on lubrication. Apply a light coating of grease on the gears using a toothpick or small brush. Oil the ball bearings also using a toothpick or small brush. Use TG’s Rocket Fuel. Let the reel dry before reassembling. Put the reel back together. Ensure that it is working before safely storing it for the next fishing trip or going out fishing with it. A fishing reel is an expensive complex machine. Learn everything you need to know about reels before embarking on cleaning them. It takes dedication and an effort to keep your fishing reel in good working condition. You will save time and money if you can maintain your fishing reel yourself. If you were never taught to clean your fishing gear, you don’t want to learn from experience by having to replace a fishing reel because it was not well maintained. Some reels have very tiny parts that can only be handled by a professional. Please opt to use a professional cleaning service if you are not comfortable with disassembling and cleaning your fishing reel. Read the user manual carefully and watch a video on the same. You can manage specific cleaning routines yourself.